Oil price (WTI) decreased by 1.32% during last week. Conversely, the price of Brent oil edged up by 0.34%. As a result, the gap of Brent oil over WTI widened: The premium ranged between $13.30 and $14.73. Last week, the EIA’s weekly report showed a rise in oil’s stockpiles of 3 million barrels – first gain in eleven weeks. Will oil continue to fall? This week, several reports may affect oil prices. These items include: OPEC monthly update, China new loans, U.S Philly fed index, U.S retail sales, and EIA oil weekly update. In the chart below are the daily changes in WTI and Brent oil prices during the past several months (prices are normalized to January 31st). 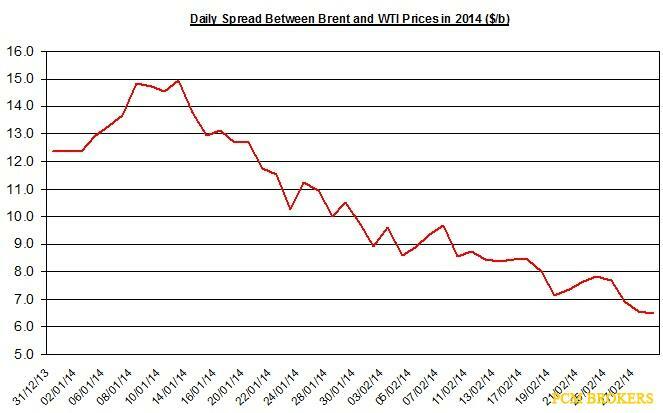 As seen below, Brent and WTI oil prices declined in the past month. The difference between Brent and WTI oilrose last week as it ranged between $13.30 and $14.73 per barrel. During the week, the premium increased by $1.60 per barrel. Demand: Refinery inputs remained unchanged last week. In total, the demand was still higher than the supply. But due to no change in demand and rise in supply, the gap between supply and demand narrowed. This difference may drag down oil prices as the U.S oil market loosens. The chart below shows the developments in the difference between supply and demand and the price of oil. If U.S oil market further loosens, this could drag down oil price. The next weekly update will be released on Wednesday, January 15thand will pertain to the week ending on January 10th. The OPEC report will present the main developments in crude oil and natural gas’s supply and demand worldwide; the report will also pertain to the shifts in the production of OPEC countries during December 2013; this news may affect oil prices). The next report will be published on Wednesday, January 15th. From the supply side, the sharp rise in imports and moderate gain in production is likely to pressure down oil prices. In total, the supply expanded last week. From the demand side, refinery inputs remained flat. As a result, the storage rose for the first time in eleven weeks. 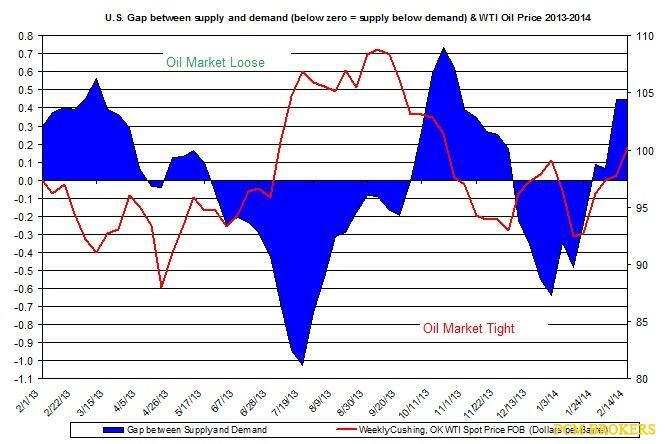 Further, the gap between supply and demand has narrowed, albeit the demand remains higher than the supply; this could suggest the oil market has loosened. Looking forward, the upcoming reports regarding U.S and Europe could offer some additional insight regarding the developments in oil demand in these countries. The difference between Brent and WTI ranged between $13 and $14. The slightly looser oil market in the U.S is likely to widen the gap between WTI and Brent oil. On the other hand, if the US dollar continues to weaken, this could pull up oil prices. The bottom line, on a weekly scale, I guess oil price may continue to fall and the gap between WTI and Brent further widen. Oil price (WTI) bounced back and increased by 1.78% during last week. Conversely, the price of Brent oil edged down by 0.18%. As a result, the gap of Brent oil over WTI narrowed: The premium ranged between $12.69 and $14.95. Last week, the EIA’s weekly update showed a drop in oil’s stockpiles of over 10 million barrels – the sharp drop in oil imports contributed to the fall in oil stockpiles. Will oil continue to rally? This week, several reports may affect oil prices. These items include: U.S and Chinas flash manufacturing PMI, China’s GDP, IEA monthly update, U.S existing home sales, and EIA oil weekly report. In the chart below are the daily shifts in WTI and Brent oil prices during the past several months (prices are normalized to January 31st). 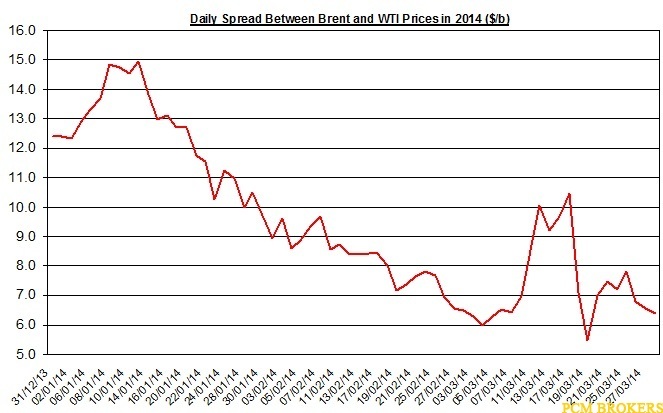 As seen below, Brent and WTI oil prices decreased during January. The difference between Brent and WTI oilrose last week as it ranged between $12.69 and $14.95 per barrel. During the week, the premium decreased by $1.84 per barrel. Demand: Refinery inputs slipped by 0.3% last week. In total, the demand was still higher than the supply. Moreover, due to little decline in demand and sharp fall in supply, the gap between supply and demand widened. This wider gap may pressure up oil prices as the U.S oil market tightens. If U.S oil market further tightens, this could continue to pull up oil price. The next weekly report will be released on Wednesday, January 23rd and will pertain to the week ending on January 18th. The OPEC report came out last week and showed OPEC’s oil production remained nearly unchanged during last month: OPEC’s production during December reached 29.443 million bbl/d – a 20 thousand bbl/d slip. This modest decline in production is mostly due to Iraq, Venezuela and Saudi Arabia. Libya’s oil production remains low at 261 thousand bbl/d – nearly one fifth of its normal capacity. OPEC’s oil production during December was around 5% lower than the average during 2012. If this low production remains, this could continue to pressure up oil prices mainly Brent oil. This upcoming monthly report will present an updated (for December) outlook and analysis for the global crude oil and natural gas market for 2013 and 2014. The next report will be published on Tuesday, January 21st. From the supply, the sharp drop in imports and moderate rise in production is likely to pressure up oil prices. In total, the supply contracted last week. From the demand, refinery inputs slightly fell As a result, the storage fell for eleventh time in twelve weeks. Further, the difference between supply and demand has expanded, as the demand remains higher than the supply; this could suggest the oil market has tightened. Looking forward, the upcoming reports regarding U.S and China could offer some additional insight regarding the developments in oil demand in these countries. 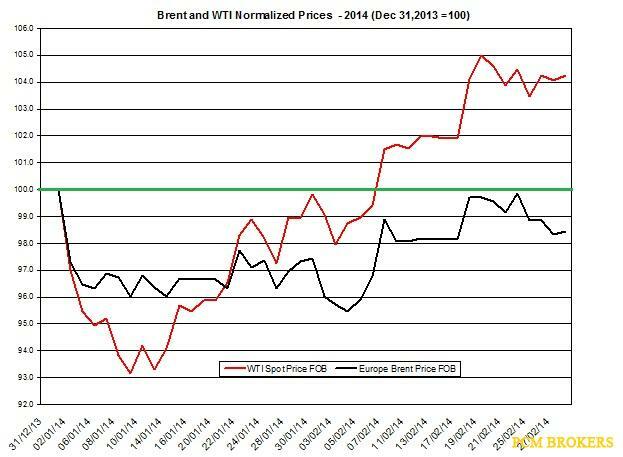 The difference between Brent and WTI ranged between $12 and $14. The slightly tighter oil market in the U.S is likely to narrow the gap between WTI and Brent oil. Conversely, if the US dollar continues to strengthen, this could pull down oil prices. The bottom line, on a weekly scale, I guess oil price may continue to slowly rise and the gap between WTI and Brent to remain stable. 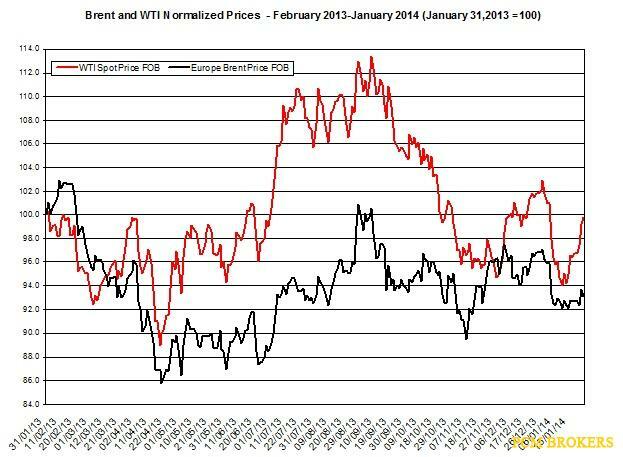 Oil price (WTI and Brent) rallied again during last week. WTI oil and Brent oil rose by 2.41% and 0.77%, respectively. As a result, the gap of Brent oil over WTI narrowed: The premium ranged between $12.69 and $10.26. Last week, the EIA’s weekly update showed a decline in oil’s stockpiles of 4 million barrels. Will oil continue to rise? This week, several reports may affect oil prices. These items include: U.S GDP, China’s manufacturing PMI, U.S core durable goods, and EIA oil weekly report. In the chart below are the daily changes in WTI and Brent oil prices during the past several months (prices are normalized to January 31st). As seen below, Brent and WTI oil prices rallied during recent week. The gap between Brent and WTI oilrose last week as it ranged between $12.69 and $10.26 per barrel. During the week, the premium decreased by $1.45 per barrel. Demand: Refinery inputs fell by 1.6% last week. In total, the demand was still higher than the supply. Moreover, due to sharp drop in demand and little fall in supply, the gap between supply and demand narrowed. This narrower gap may drag down oil prices as the U.S oil market loosened. 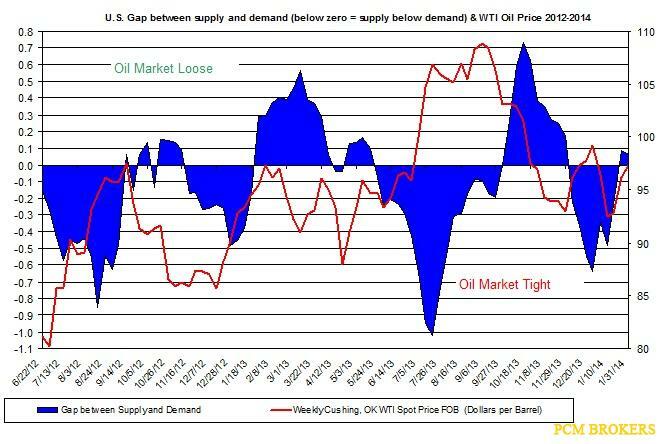 The chart below shows the changes in the difference between supply and demand and the price of oil. The next weekly report will be released on Wednesday, January 30th and will pertain to the week ending on January 24th. According to the recent report, OECD’s industry oil inventories tumbled down by 53.6 mb during November. The outlook for global oil refinery was raised by 110 tb /d to reach 76.8 mb/d. Global oil supplies edged down by 25 tb /d month-over-month to 92.23 mb/d during December. The global demand for 4Q13 was raised by 135 tb /d due to unexpectedly strong US deliveries, partly offset by curtailments in China and other countries. From the supply, the modest decline production and stable oil imports resulted in a slight decline in oil supply, which could have little effect on the price of oil. From the demand, refinery inputs sharply fell. Nonetheless, the storage declined again for twelve out of the past thirteen weeks. Further, the difference between supply and demand has expanded, as the demand remains higher than the supply; this could suggest the oil market has tightened. Looking forward, the forthcoming reports regarding U.S and China could offer some additional insight regarding the progress in the demand for oil in these countries. The gap between Brent and WTI ranged between $10 and $12. The slightly looser oil market in the U.S is likely to widen the gap between WTI and Brent oil. Conversely, if the US dollar continues to weaken, this could pull up oil prices. The bottom line, on a weekly scale, I guess oil price may change course and fall and the gap between WTI and Brent to slightly narrow. 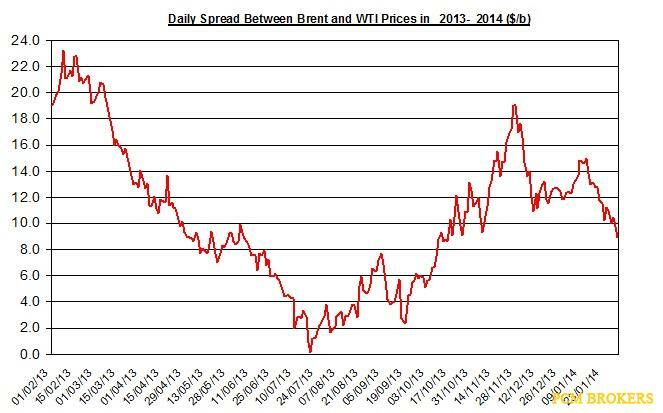 Oil price (WTI) slightly rose again during last week, while Brent oil declined. WTI oil rose by 0.88%; Brent oil slipped by 1.37%. As a result, the gap of Brent oil over WTI narrowed: The premium ranged between $8.91 and $10.97. Last week, the EIA’s weekly update showed a drop in oil’s stockpiles of 3.8 million barrels. Will oil change direction? This week, several reports may affect oil prices. These items include: U.S NF payroll report, U.S manufacturing PMI, U.S factory orders, and EIA oil weekly report. In the chart below are the daily shifts in WTI and Brent oil prices during the past several months (prices are normalized to January 31st, 2013). As seen below, Brent and WTI oil prices didn’t do much in recent weeks. The difference between Brent and WTI oilslipped last week as it ranged between $8.91 and $10.97 per barrel. During the week, the premium decreased by $2.33 per barrel. Demand: Refinery inputs declined by 1.3% last week. In total, the demand was lower than the supply – the first time since late November 2013. In other words, due to drop in demand and rise in supply, the gap between supply and demand changed course. This current gap may drag down oil prices as the U.S oil market is much looser than it was back in a few weeks back. 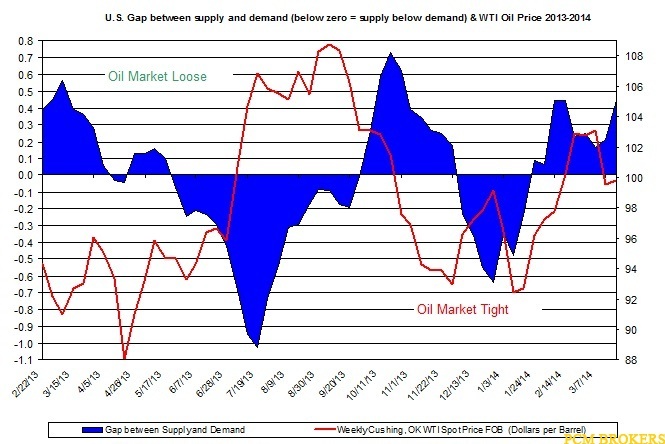 The chart below shows the changes in the gap between supply and demand and the price of oil. If U.S oil market loosens further, this could drag down oil price. The next weekly report will be released on Wednesday, February 5th and will refer to the week ending on January 31st. From the supply, the modest decline production was offset by the rise in imports; the result was a rise in oil supply. From the demand, refinery inputs declined again. Nonetheless, the storage fell again. 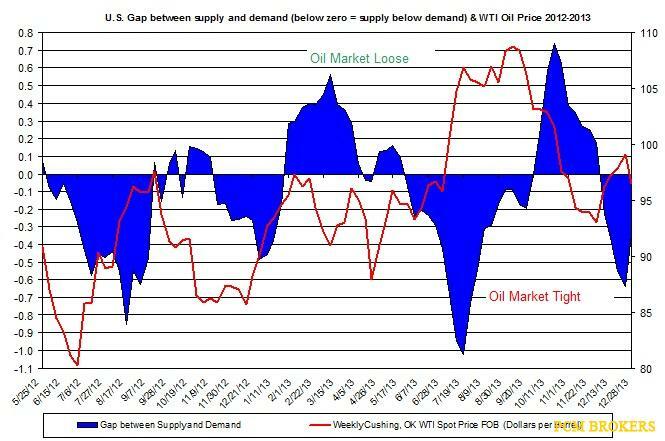 Further, the difference between supply and demand has shifted so that the supply is higher than the demand; this could suggest the oil market has loosened. Looking forward, the upcoming reports regarding U.S could offer some additional insight regarding the progress in the demand for oil. The gap between Brent and WTI ranged between $9 and $10. The looser oil market in the U.S may widen the gap between WTI and Brent oil. Moreover, if the US dollar continues to strengthen, this could pull down oil prices. 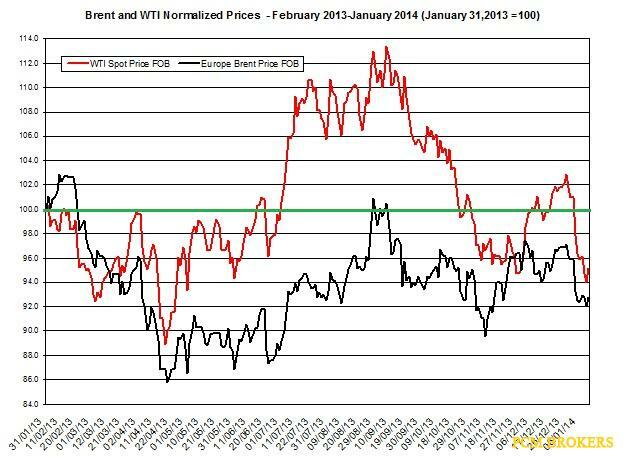 The bottom line, on a weekly scale, I guess oil price may decline and the gap between WTI and Brent to slightly widen. 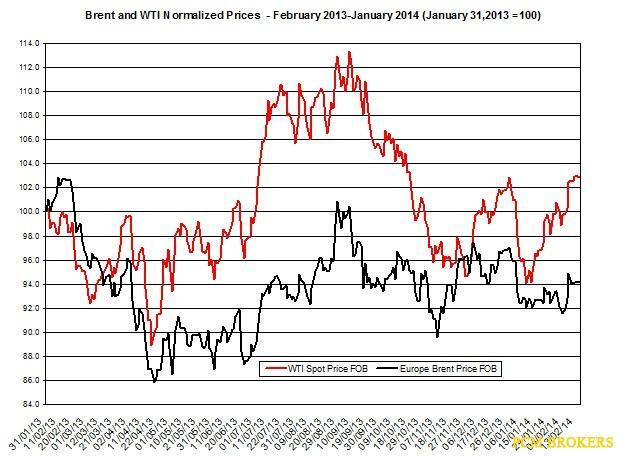 Oil price (WTI and Brent) rose again during last week. WTI oil rose by 2.5%; Brent oil, by 3%. As a result, the gap of Brent oil over WTI widen: The premium ranged between $8.59and $9.69. Last week, the EIA’s weekly update showed another decline in oil’s stockpiles of 5.3 million barrels. Will oil continue to rise? This week, several reports may affect oil prices. These items include: U.S retail sales, industrial production, China’s new loans, OPEC and IEA monthly updates, and EIA oil weekly report. In the chart below are the daily changes in WTI and Brent oil prices during the past several months (prices are normalized to January 31st, 2013). 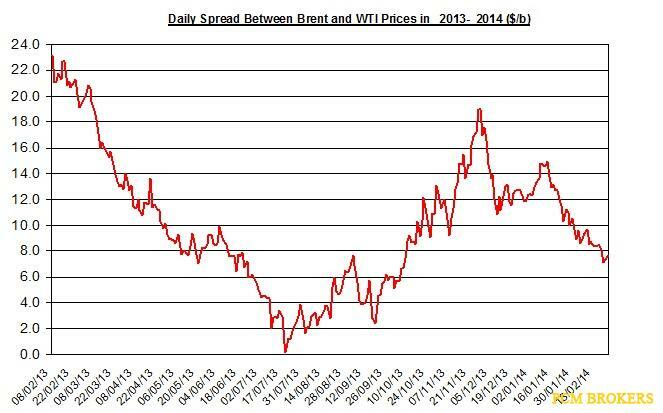 As you can see below, Brent and WTI oil prices rallied in recent weeks. The gap between Brent and WTI oilslightlyrose last week as it ranged between $8.59 and $9.69 per barrel. During the week, the premium rose by $0.78 per barrel. Demand: Refinery inputs declined by 1.7% last week. In total, the demand was still lower than the supply, but the gap between supply and demand contracted. This current gap may curb down oil prices from further rising as the U.S oil market is still looser than it was back in a few weeks back. The next weekly report will be released on Wednesday, February 12th and will refer to the week ending on February 7th. The OPEC report will present the main developments in crude oil and natural gas’s supply and demand worldwide; the report will also refer to the shifts in the production of OPEC countries during January 2014; this news may affect oil prices. The next report will be published on Wednesday, February 12th. This upcoming monthly report will present an updated (for January) forecast and analysis for the global crude oil and natural gas market for 2013and 2014. The next report will be published on Thursday, February 13th. From the supply, the sharp decline imports and modest drop in production resulted in a sharp drop in oil supply. From the demand, refinery inputs sharply declined as well. Further, the storage dropped again. In total, while the supply was still higher than demand, the gap between the two has contracted. This could suggest the oil market has tightened. Looking forward, the upcoming reports regarding U.S and China could offer some additional insight regarding the progress in the demand for oil. The IEA and OPEC reports could offer info about the changes in production and updated forecasts for supply and demand. The gap between Brent and WTI ranged between $8 and $9. The tighter oil market in the U.S may narrow the gap between WTI and Brent oil. Moreover, if the US dollar continues to weaken, this could pull up oil prices. The bottom line, on a weekly scale, I guess oil price may continue to slowly rise and the gap between WTI and Brent to slightly contact. 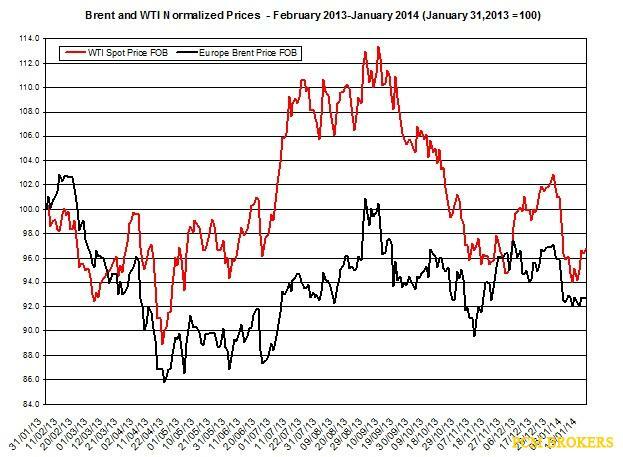 Oil price (WTI and Brent) didn’t do much during last week. WTI oil slightly rose by 0.42%; Brent oil slipped by 0.77%. As a result, the gap of Brent oil over WTI narrowed: The premium ranged between $8.38 and $8.74. Last week, the EIA’s weekly report showed a rise in oil’s stockpiles of 2 million barrels. Will oil change direction and fall? This week, several reports may affect oil prices. These items include: U.S Philiy Fed index, China’s manufacturing PMI, and EIA oil weekly report. In the chart below are the daily shifts in WTI and Brent oil prices during the past several months (prices are normalized to January 31st, 2013). 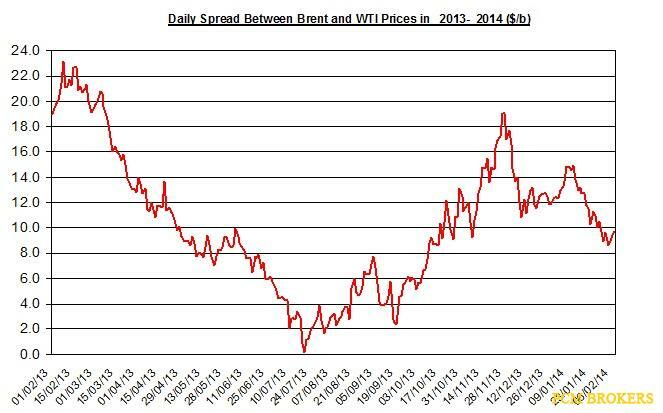 As you can see below, Brent and WTI oil prices slightly rose in recent weeks. The gap between Brent and WTI oilslightlynarrowed last week as it ranged between $8.38 and $8.74 per barrel. During the week, the premium fell by $1.28 per barrel. Demand: Refinery inputs declined by 0.8% last week. In total, the demand was lower than the supply, and the gap between supply and demand widened. This current gap may pull down oil prices as the U.S oil market is looser than it was last week. 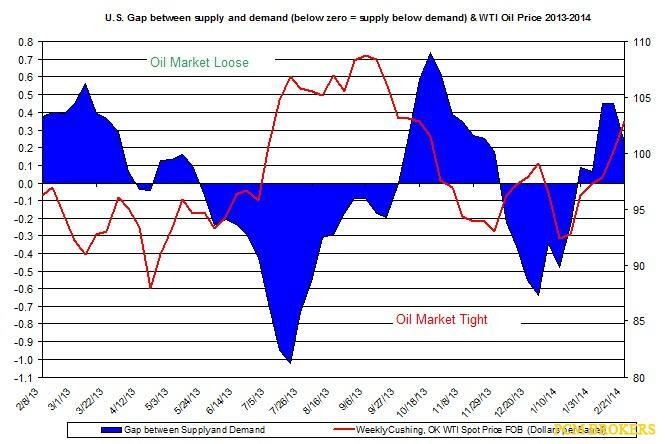 The chart below presents the changes in the gap between supply and demand and the price of oil. The next weekly report will be released on Wednesday, February 19th and will refer to the week ending on February 14th. The OPEC report came out last week and showed a modest gain in OPEC’s oil production in the past month: OPEC’s production during January reached 29.711 million bbl/d – a 28 thousand bbl/d gain. This modest rise in production is mostly due to Libya’s sharp rise in production from 240 thousand bbl/d to 510 thousand bbl/d – a 270 thousand bbl/d. Libya’s current output is still at third of its capacity. This rise was offset by the drop in production in Saudi Arabia and Angola. If OPEC’s oil production further rises, this could continue to pressure down oil prices mainly Brent oil. According to the update report, OECD’s industry oil inventories plummeted by 56.8 mb during December. Global oil supplies edged down by 290 tb /d month-over-month to 92.1 mb/d during January. From the supply, the sharp rise imports and modest decline in production resulted in an increase in oil supply. From the demand, refinery inputs declined again. Further, the storage rose. In total, the supply is still higher than demand and the gap between the two has widened. This could suggest the oil market has loosened. Looking forward, the upcoming reports regarding U.S and China could offer some additional insight regarding the progress in the demand for oil. The OPEC report showed a modest rise in production and perhaps another rise in production from Libya could increase OPEC’s production in the coming months. The gap between Brent and WTI ranged between $8 and $9. The looser oil market in the U.S may slightly widen the gap between WTI and Brent oil. Conversely, if the US dollar continues to weaken, this could pressure up oil prices. The bottom line, on a weekly scale, I guess oil price may change course and start to slowly fall and the gap between WTI and Brent to slightly widen. 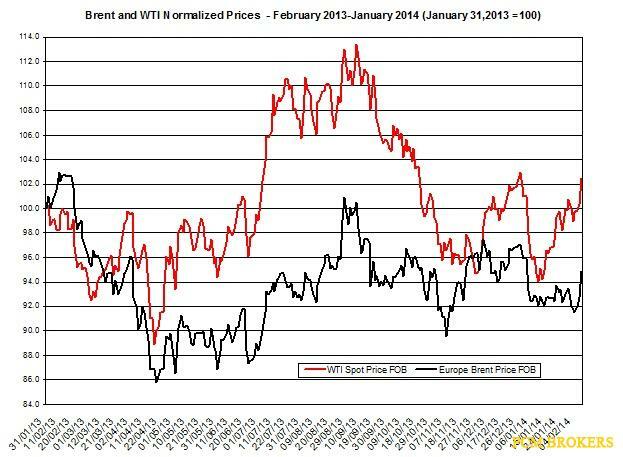 Oil price (WTI and Brent) resumed its rally during last week. WTI oil increased by 1.9%; Brent oil, by 1%. As a result, the gap of Brent oil over WTI slightly narrowed: The premium ranged between $7.16 and $8.43. Last week, the EIA’s weekly report showed a decline in oil’s stockpiles of 2.5 million barrels. Will oil continue to rise? This week, several reports may affect oil prices. These items include: U.S GDP for Q4, U.S core durable good, China’s manufacturing PMI, and EIA oil weekly update. In the chart below are the daily changes in WTI and Brent oil prices during the past several months (prices are normalized to January 31st, 2013). 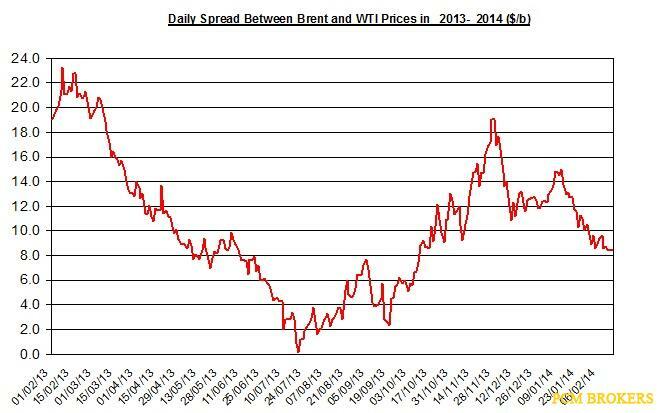 As you can see, Brent and WTI oil prices rose in recent weeks. The difference between Brent and WTI oilnarrowed again last week as it ranged between $7.16 and $8.43 per barrel. During the week, the premium dropped by $0.78 per barrel. Demand: Refinery inputs edged down by 0.1% last week. In total, the demand was lower than the supply, and the gap between supply and demand slightly widened. This current gap may pressure down oil prices as the U.S oil market is moderately looser than it was last week. If U.S oil market loosens further, this could pull down oil price. The next weekly report will be released on Wednesday, February 26th and will refer to the week ending on February 21st. From the supply, the modest decline in imports was offset by the slight rise in production so that the oil supply remained nearly unchanged. From the demand, refinery inputs inched down again. Further, the storage slipped. In total, the supply was still higher than demand but the gap between the two remained nearly unchanged. This could suggest the oil market has moderately loosened or perhaps just remained unchanged. Looking forward, the upcoming reports regarding U.S and China could offer some additional information regarding the progress in the demand for oil. The gap between Brent and WTI ranged between $7 and $8. The looser oil market in the U.S may further widen the gap between WTI and Brent oil. Conversely, if the US dollar continues to weaken against the Euro, this could pull up oil prices. The bottom line, on a weekly scale, I guess oil price may slightly come down; the gap between WTI and Brent may slightly narrow. Oil price (WTI) slightly rose during last week. WTI oil inched up by 0.4%; Brent oil slipped by 0.8%. As a result, the gap of Brent oil over WTI narrowed again: The premium ranged between $6.48 and $7.82. Last week, the EIA’s weekly report showed a modest drop in oil’s stockpiles of 0.5 million barrels. Will oil change direction? These items include: U.S NF payroll report, U.S durable goods, U.S and China’s manufacturing PMI, and EIA oil weekly update. In the chart below are the daily shifts in WTI and Brent oil prices during the past several months (prices are normalized to December 31st, 2013). 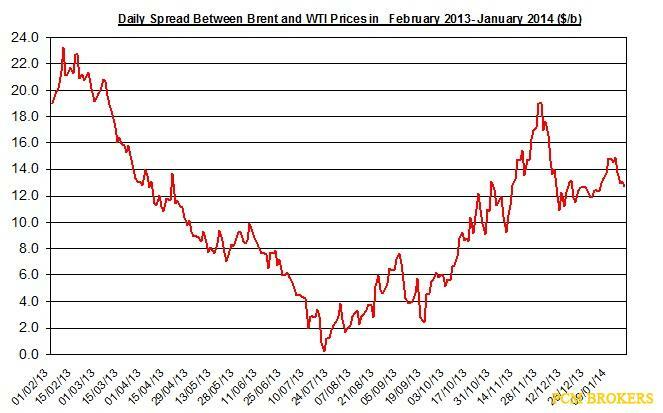 As you can see, Brent and WTI oil prices increased in recent weeks. The difference between Brent and WTI oilnarrowed again last week as it ranged between $6.48 and $7.82 per barrel. During the week, the premium dropped by $1.17 per barrel. Demand: Refinery inputs edged down by 0.2% last week. In total, the demand was lower than the supply, and the gap between supply and demand narrowed. This current gap may pressure down oil prices as the U.S oil market is moderately tighter than it was last week. 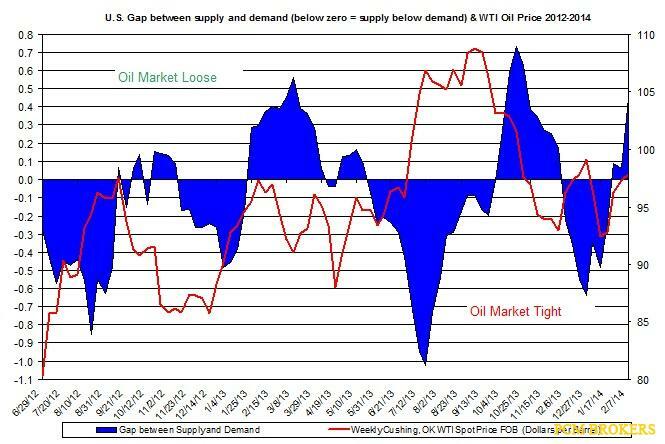 The chart below shows the shifts in the gap between supply and demand and the price of oil. The next weekly report will be released on Wednesday, March 5th and will refer to the week ending on February 28th. From the supply, the plunge in imports and stagnate production resulted in a drop in the oil supply. From the demand, refinery inputs slipped again. Further, the storage slightly fell. But in total, the supply was still higher than demand even though the gap between the two narrowed. This could suggest the oil market has moderately tighter. Looking forward, the upcoming reports regarding U.S and China could offer some additional information regarding the progress in the demand for oil. The gap between Brent and WTI ranged between $6 and $7. The tighter oil market in the U.S may further narrower the gap between WTI and Brent oil. Moreover, if the US dollar continues to weaken against the Euro, this could pull up oil prices. 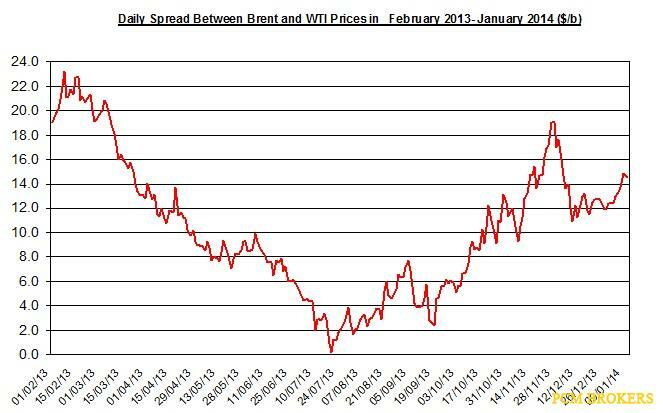 The bottom line, on a weekly scale, I guess oil price may slightly rise; the gap between WTI and Brent may drop again. Oil prices (WTI and Brent) rallied last week. WTI and Brent oil rose by 2.2% and 1.1%, respectively. 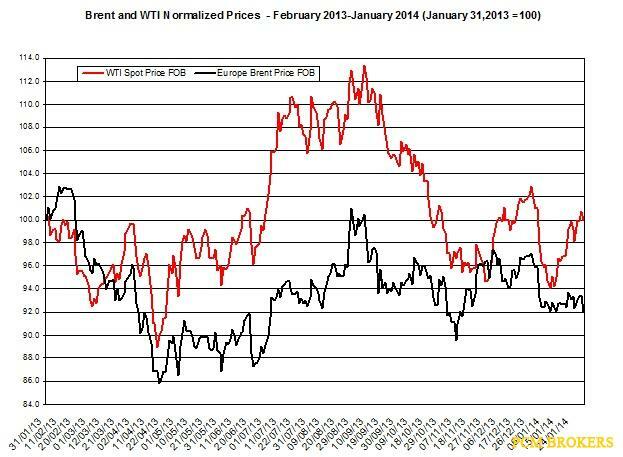 As a result, the difference of Brent oil over WTI narrowed again: The premium ranged between $6.4 and $7.46. Last week, the EIA’s weekly report showed a rise in oil’s stockpiles of 5.5 million barrels. Will oil continue to rise? This week, several reports may affect oil prices. These items include: U.S factory orders, China’s manufacturing PMI, U.S non-farm payroll report, U.S manufacturing PMI, and EIA oil weekly update. In the chart below are the daily shifts in WTI and Brent oil prices during the past several months (prices are normalized to December 31st, 2013). As you can see, Brent and WTI oil prices rallied past several days. The gap between Brent and WTI oilnarrowed last week as it ranged between $6.4 and $7.8 per barrel. During the week, the premium slipped by $1.06 per barrel. Demand: Refinery inputs slipped by 0.3% last week. In total, the demand remained well below the supply, and the gap between supply and demand widened. This turn of events may drag down oil prices as the U.S oil market is looser than it was last week. After all, the linear correlation between the weekly price of oil lagged by on period and the shifts in the gap between supply and demand is mid-strong and negative at -0.305. The next weekly report will be released on Wednesday, April 2nd and will pertain to the week ending on March 28th. From the supply standpoint, the recent rally in imports and modest gain in production resulted in a sharp rise in oil supply. From the demand standpoint, refinery inputs continue to slowly decline. Moreover, the storage rose. In total, the supply was higher than demand and the difference between the two expanded again. This could suggest the oil market has loosened. Looking forward, the upcoming reports referring to the U.S and China could offer some information regarding the progress in the demand for oil. If these reports are mostly positive, this could pressure back up the price of oil. The gap between Brent and WTI ranged between $5 and $10 and is likely to remain at this range. The bottom line, on a weekly scale, Oil might slightly decline in the near future. 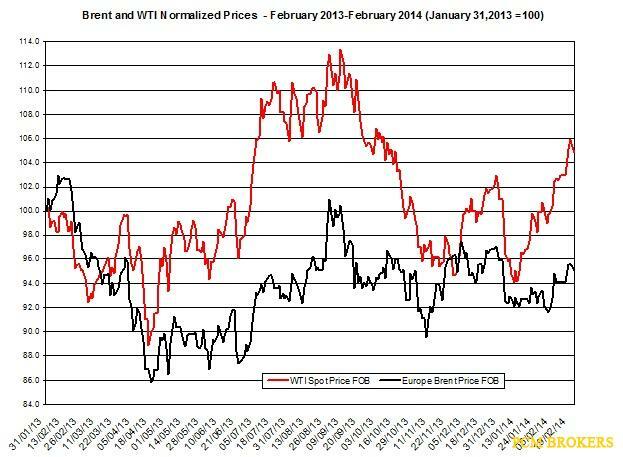 Oil prices (WTI and Brent) changed direction and declined last week. WTI and Brent oil slipped by 0.5% and 1.2%, respectively. As a result, the gap of Brent oil over WTI contracted again: The premium ranged between $5.2 and $6.2. Last week, the EIA’s weekly report showed a modest drop in oil’s stockpiles of 1.2 million barrels. Will oil bounce back? This week, several reports may affect oil prices. These items include: U.S PPI, China’s new loans, U.S JOLTS job opening, OPEC monthly report, IEA monthly update, and EIA oil weekly update. 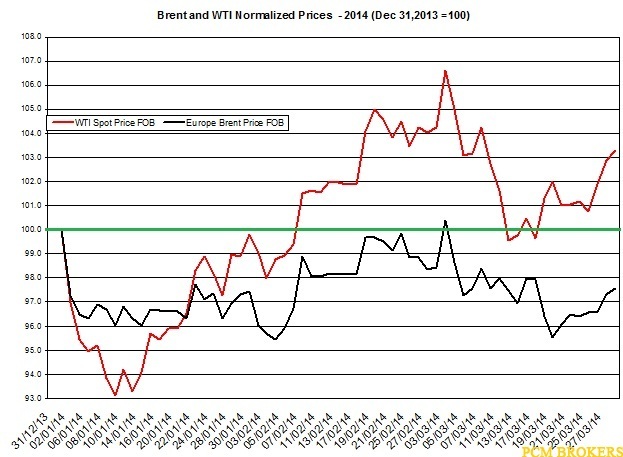 In the chart below are the daily changes in WTI and Brent oil prices during the past several months (prices are normalized to December 31st, 2013). As you can see, Brent and WTI oil prices changed direction and slipped in the past several days. The difference between Brent and WTI oilnarrowed last week as it ranged between $5.17 and $6.18 per barrel. During the week, the premium slipped by $0.82 per barrel. Demand: Refinery inputs rose by 0.2% last week. In total, the demand remained below the supply, and the difference between supply and demand slightly narrowed. 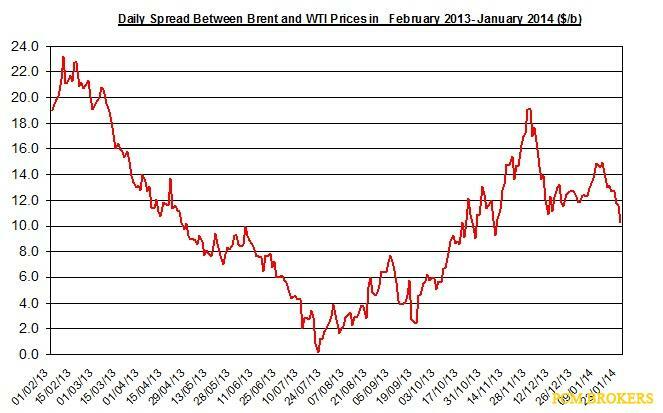 This recent development may pull back up oil prices as the U.S oil market is slightly tighter than it was a week back. After all, the linear correlation between the weekly price of oil lagged by on period and the changes in the gap between supply and demand is mid-strong and negative at -0.302. 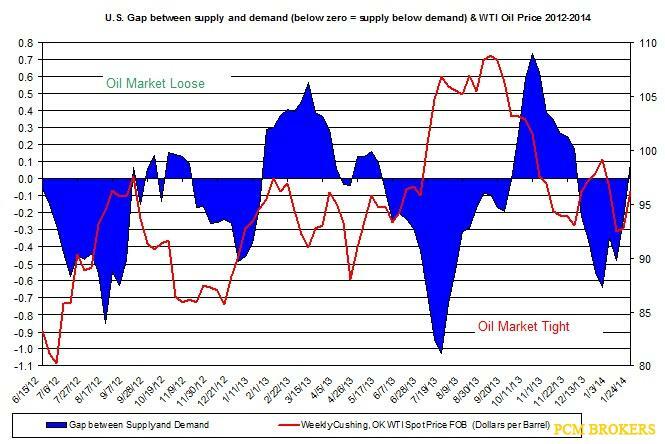 The chart below presents the changes in the difference between supply and demand and the price of oil. If U.S oil market continues to tighten, this could pull up oil price. The next weekly report will be released on Wednesday, April 9th and will refer to the week ending on April 4th. This upcoming monthly report will present an updated (for March) outlook and analysis for the global crude oil and natural gas market for 2013 and 2014. The next report will be published on Thursday, April 10th. OPEC will release a monthly update of the main developments in crude oil and natural gas’s supply and demand worldwide; the report will also refer to the changes in the production of OPEC countries during August 2012; this news may affect oil prices (See here a summary of the previous report). The next report will be released on Friday, April 11th. Thursday – China’s CPI: The CPI slipped to an annual rate of 2%; if the annual rate declines again, it could signal the Chinese economy is slowing down. From the supply side, the recent sharp fall in imports offset the modest rise in production; and this resulted in a slight decline in oil supply. From the demand side, refinery inputs changed direction and slightly increased. Moreover, the storage moderately declined. In total, the supply was still higher than demand but the difference between the two narrowed. This could suggest the oil market has tightened. Looking forward, the forthcoming reports regarding the U.S and China could offer some additional insight regarding the latest changes in these two top oil consumers worldwide. The difference between Brent and WTI ranged between $5 and $7 and is likely to remain at this range. The bottom line, on a weekly scale, oil might slightly recover in the near future.